COLLEGE STATION - State Sen. Judith Zaffirini received the "Extension in the City Award" Saturday in a ceremony at Texas A&M University. 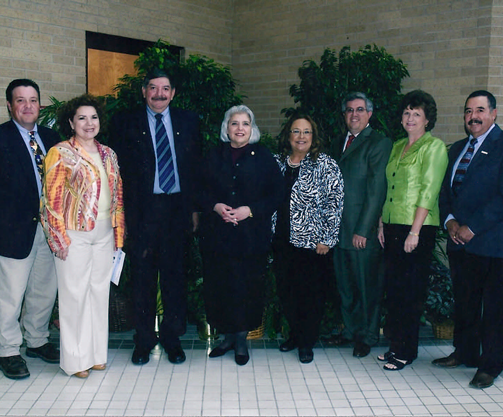 "Receiving the 2010 Extension in the City Award is especially meaningful, because I appreciate the Texas AgriLife Extension Service so much and believe strongly in its mission to serve Texas through community-based education," Zaffirini said. "I am delighted to champion important AgriLife Extension programs that promote healthy families, environmental stewardship and volunteerism." The honor, created in 2006 to recognize urban leaders who support AgriLife Extension programs, cited Zaffirini's "passion to improve life for families and youth (and her) long record of purpose-driven public service, especially to improve public education, higher education, and health and human services." The award signifies the "highest regard and gratitude" of AgriLife Extension educators, particularly in 21 counties organized under the agency's Urban Program. "We know that when spurring others to action, you have given of yourself in abundance, and we are grateful and inspired," said Dr. Mark Hussey, vice chancellor and dean of agriculture and life sciences for the Texas A&M System. Zaffirini, D-Laredo, is the second highest-ranking Texas state senator, the highest-ranking woman and Hispanic senator, and the highest-ranking senator for Bexar County and the border region. She became chair of the Senate Higher Education Committee in 2009. Her work ethic is legendary: She has a 100 percent voting record and has had 100 percent attendance in the Texas Senate since 1987,except for breaking quorum deliberately to prevent an untimely re-redistricting that the U.S. Supreme Court in 2006 ruled violated the Voting Rights Act. But it is her efforts for the people in her district's urban areas in cooperation with AgriLife Extension that drew the most recent praise. "Sen. Zaffirini has provided more opportunities for early childhood education and strengthened the prevention of developmental disabilities through good nutrition and health care," said Dr. Ed Smith, AgriLife Extension director, in presenting the award. "As a statewide agency, we follow her leadership in our mission to improve the lives of people, businesses and communities across Texas and beyond through high-quality, relevant education." Smith said AgriLife Extension faculty conduct training to improve the quality of service among day-care providers, support literacy and family life through such programs as FRED, or "Fathers Reading Every Day." The agency also administers two programs that target food stamp-eligible residents with education to improve their nutrition and food security, he noted. Please correct spelling error in title. Residant is incorrect. The correct spelling is Resident.